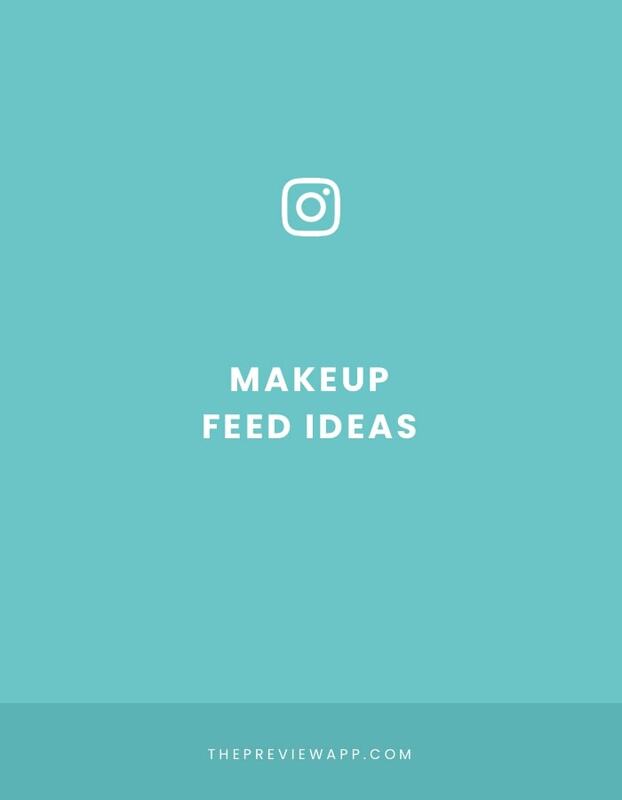 I found 19 different Instagram feed ideas for makeup. I’m going to show you different Instagram themes, feed layouts and grids you can create. Quick tip: You can use Preview app to design your feed, edit your photos, schedule your posts (and even find hashtags). First feed idea for makeup: show faces, faces, and faces. Keep it simple. Show your beautiful work, one face at a time. You’ll notice most people take a headshot from the same distance. This makes the feed look very consistent overall. Zoom in! Focus on the skin, eyes and lips. For the best results, try to use the same lighting on all your photos. Good lighting will make your feed look consistent very quickly. Quick tip: We love @uribexo! Look how she uses the caption to explain which product she uses. Good idea! If you specialise in eye makeup, then zoom in even more! Take a photo of your eye makeup only. This is one of the most popular Instagram feed ideas for makeup: the “Row by Row” Feed Layout. No wonder it is so popular! Another favorite in the industry is to use the “Line in the Middle” feed layout. This is one of my favorites: the “Tiles” feed layout. Kim Kardashian’s makeup account used the Tiles layout a few times. @maskcarabeauty also uses the tiles layout. The trick is to alternate between 2 types of posts. I couldn’t find someone using a “Puzzle” feed layout (I’m sure there is someone doing it though). The color theme can depend on a season, a new range, or your brand identity. I love rainbow feeds! A rainbow feed is when the colors in your feed change when you scroll down. The colors usually follow the colors of the rainbow – hence why I call it a “Rainbow Feed”. I couldn’t find makeup accounts doing a rainbow feed, apart from @maccosmetics. Just to give you more rainbow feed inspiration, check out @sarah_peretz too – the Rainbow Feed queen. Some makeup accounts only show makeup products. As you can see above, it is popular to use the same background for your photos. It keeps the feed looking cohesive and organised. Since the background looks simple and clean, the focus is always on the makeup. Another good idea is to use white borders. White borders make your photos pop in the Instagram Explore feed. You can instantaneously spot a photo with white border in the ocean of square photos. If you want to add even more structure to your feed, try to use the same white border on all your photos. You can also only show swatches of different beauty products. These kind of photos are very popular too. They catch the attention and are a great way to showcase products. Some people specialise in taking videos of themselves doing their makeup. Usually the videos are timelapse (they play very fast). First, these videos can make you go viral because they catch our attention. Second, it’s an awesome way for people to see your steps from start to finish. Talking about start to finish, some people share their before and after photos. Create a carousel post using Preview app. Some makeup artists also share photos of their beautiful models in their elements, when doing a photoshoot. This is a beautiful opportunity to showcase your work and final product: hair done, impeccable clothes and makeup on fleek. You can also show your life outside of your work. You can share snippets of yourself, your home, your dog, your food, etc… This is a fantastic way to build rapport with future clients and grow your personal brand: people can see what you do (create amazing makeup looks) and who you are. A great example is @makeupby_jaz. In her feed, she mixes photos of her makeup looks and her behind out-and-about. Want to create something crazy? Share super fun, unique makeup looks. These will for sure get the attention of people on Instagram. You can create special makeup looks or tutorials for certain occasions, like Halloween. You’re creative but don’t want to show your face? Then think out of the box. Where can you create the makeup looks? @gabxxrielle creates makeup looks on her arm!